Sellier & Bellot is a trusted global brand that has produced high-performance and dependable ammunition products to the shooting sports marketplace since 1825. With billions of rounds of small-caliber ammunition sold in more than 50 countries, you can be confident that an industry leader stands behind your purchase with the products and services you deserve. The innovation is clear. The workmanship is evident. The quality speaks for itself. Being good at what we do isn't arrogance when it's backed up with 187 years of proof and millions of satisfied customers worldwide. 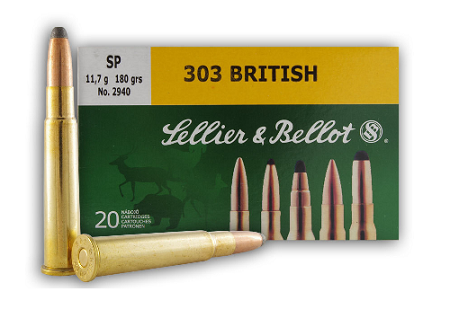 Sellier & Bellot rifle ammunition is designed and field-tested to provide shooters and hunters with the widest selection of caliber offerings and the highest performance projectiles in the market today. Soft Point projectiles are famous for high-energy impact and reliable expansion. Soft point bullets work very well for most hunting applications as the exposed lead soft point initiates expansion to produce a mushroom-like shape, which enhances the lethal effect. These reliable projectiles are available in a wide assortment of calibers at an economical price.